Anoola DJ195 Vanilla Embroidered Dress and Cape. A beautiful soft crepe dress and separate cape with subtle embroidered detail on the skirt. The dress has a high neckline with short sleeves and the fluted midi length hemline makes this an easy-to-wear, but extremely stylish outfit. Gabriela Sanchez ivory waffle textured flounce sleeve dress. Features all over waffle textured fabric with v neckline and back concealed zip. The feature flounce sleeve has pretty ivory embroidered floral appliques. A beautiful ivory choice for Mother of the Bride or Groom. John Charles 26540 champagne dress. Distinctly timeless, this knee length style features sumptuous detailing ensuring you will feel confident and proud as you present yourself as the Mother of the Bride or Groom. Irresistible IR4023 bardot v neck dress. One of our most popular Mother of the bride or groom choices has had a new update. Features stunning v neck with bardot style and detailed pearl waist band on a fully ruched dress with fitted half sleeve. Irresistible IR4016 ivory and rose dress. Beautiful mother of the bride or groom choice. Features simple pencil ruched fitted skirt to contrast with the detailed top. The bodice underneath is constructed to a sweetheart style. 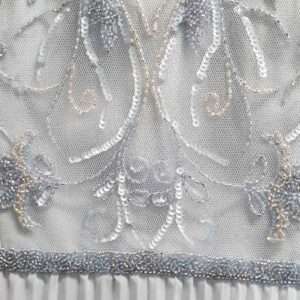 The detailed overlay is adorned with flowers and silver embroidered design. The back is buttoned to the top with covered buttons and the sleeves are fluted from the elbow. Elegant feminine and youthful. Irresistible IR3006 blossom. Beautiful mother of the bride or groom outfit with a soft flower pattern brocade that softens the fabulous structure of this dress. This dress features a v neck style off the shoulder design that is both flattering and feminine. The fully ruched effect on the dress is incredibly flattering to the figure and the soft pattern adds depth and quality. Features a feather and embellished ornamental brooch that can be removed. Irresistible IR4050. Beautiful two piece Mother of the Bride or Groom outfit presented in ivory with silver and blue flower appliques. Features a cropped reverse organza jacket with half sleeve and a v neck straight dress. This dress is ivory based jacquard with silver embossing for a luxurious metallic hue. Simply stunning simple Irresistible.